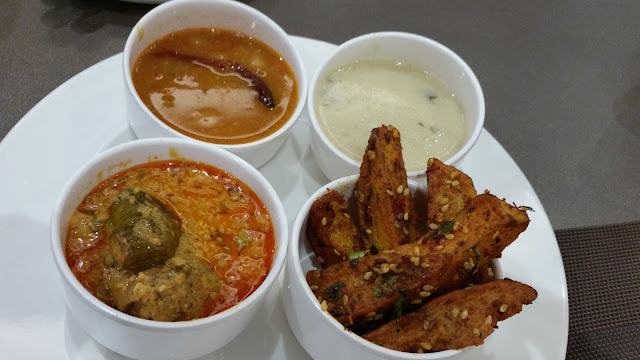 The Paigah Colony-Sindhi Colony area in Secunderabad is a vegetarian food lover’s paradise. 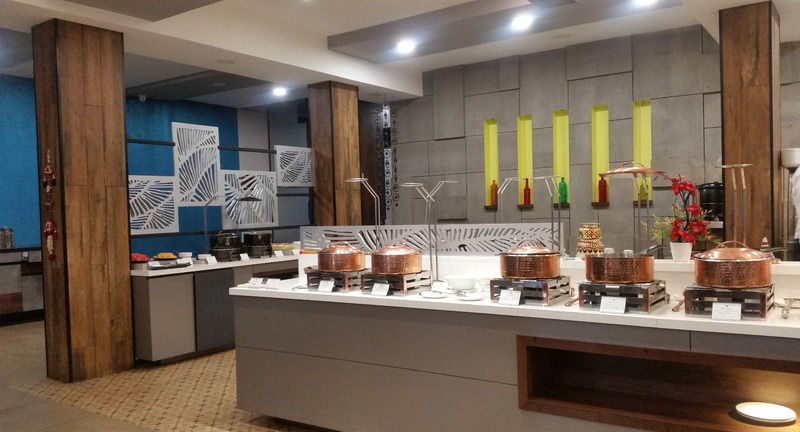 We get quite a selection of vegetarian delicacies of many cuisines ranging from street food carts to dine in restaurants. Hira Panna, a new restaurant on the main road between Paradise and Rasoolpura has started operations a few months back and I had been hearing some good feedback about the place. Though the place is known for its multi-cuisine buffet, the highlight of which is North Indian and Chinese vegetarian food, they are currently hosting a Gujarati Food Festival, presenting a buffet of dishes from the Gujarati cuisine. The owners of this place Mr Pankaj Baldev and his son Jai, run apart from Hira Panna, one of the well-known vegetarian catering services in the city by the same name. 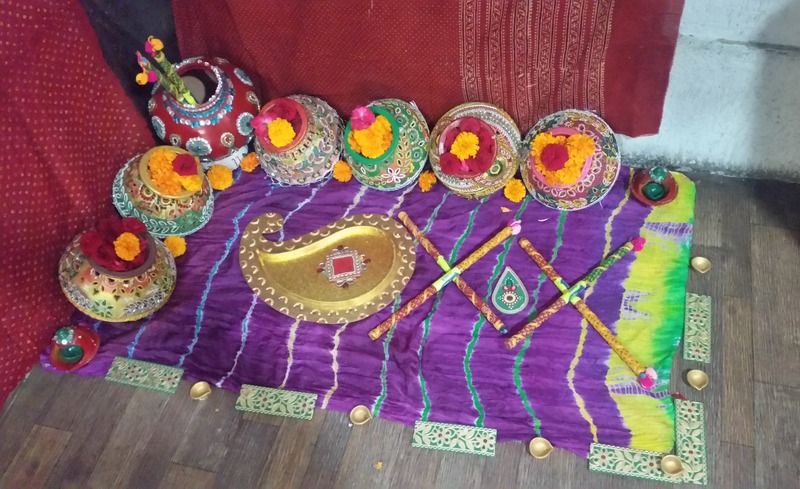 As Gujaratis settled in the Pearl City, the aim in this promotion is to expose the food lovers to some authentic food as prepared in the homes of Gujaratis. For the event, the restaurant was also decorated in traditional Gujarati style and the buffet was laid out on one side. 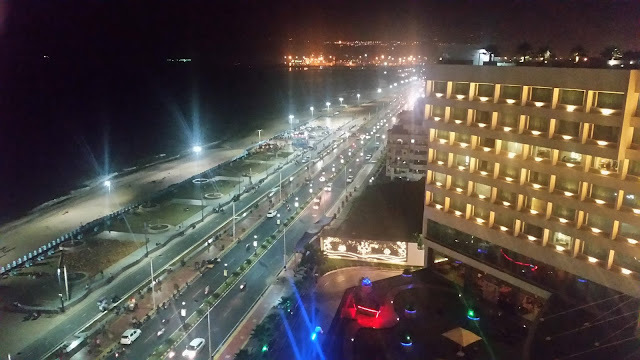 I had a long chat with Mr Pankaj and his wife who filled me up on the finer nuances of Gujarati cuisine. Coming in on a hot afternoon, we started with some Gujarati Chaas or butter milk, garnished with green chillies and pudina leaves, which had a cooling effect on us. 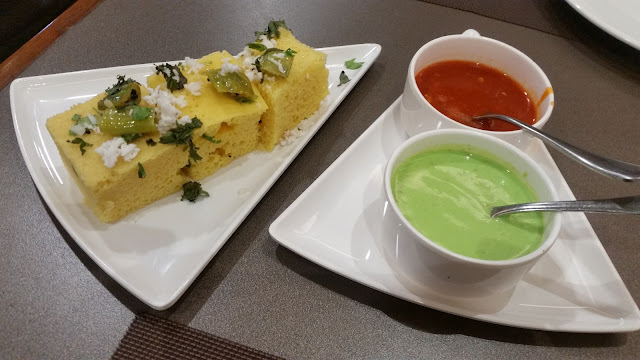 Khaman Dhokla and Matar Potli were the first set of dishes we tried out. The fluffy dhoklas were soft and went well with the green chutney served with it. The Matar Potli was a twist on the matar kachori, the filling here presented inside small fried pockets. I absolutely loved the spicy inside with a sweet tinge, again with the same chutney. Some fresh Aamras with Puris was next. We usually have sweet stuff at the end, but here the thick mango pulp worked well with the puris. I was told that the mango pulp here is made using both the Hyderabadi and Gujarati varieties of mango. The chaat offering had Gujarati Pani Puri and the usual chaat with dahi and sev. 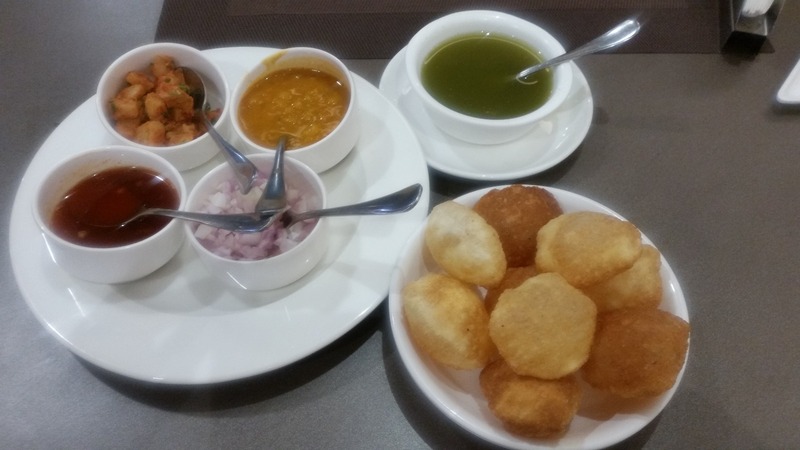 The pani puri was served with a lot of accompaniments like chole, onions, spiced potato, chutney and the green tangy pani. 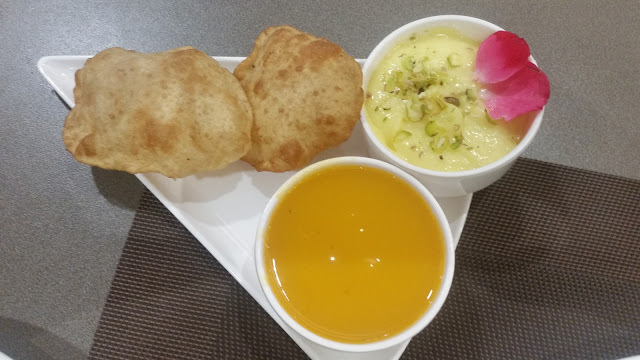 I am a golgappa lover, and the taste of this variant, though a trifle sweet, was commendable especially due to the taste of the potato mix. The chaat was par for the course. At this stage, Puran Poli was served. I was told that the Puran Poli in Gujarat uses tur dal and sugar instead of the usual chana dal and jaggery. A word about the pickles served. There was an absolute killer sweet mango pickle which was my constant companion throughout the meal. Apart from this, there was a tasty papaya preparation and another version of mango pickle, this time spicy. So far, all the preparations were simple and tasty, and my expectation had gone up. The buffet had Undhiyo one of the signature Gujarati dishes. A mixed vegetable curry, it also has methi muthiyas in it to enhance the taste. We were served some really soft and thin phulkas laced with ghee to go with it. Rajwadi Aloo, a dry potato preparation was a winner for me too. Surti dal was a sweet and sour preparation, which I thought would go well with rice. We were advised to try the Masala Khichdi with Kadi. 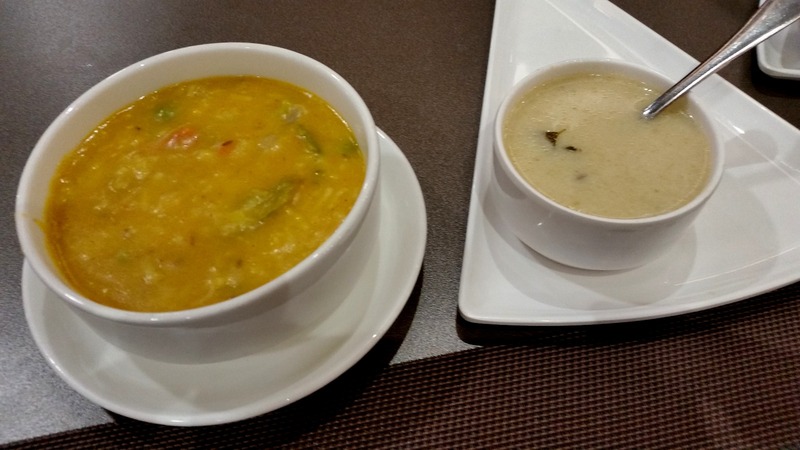 The khichdi was a ghee flavoured preparation, and not very spice laden. It had a sweetish taste and was pure comfort food, though I realized later that it was quite heavy and filling. The Kadi here was prepared from curd, and without any besan in it, and went well with the khichdi, though I loved the latter in standalone mode too. 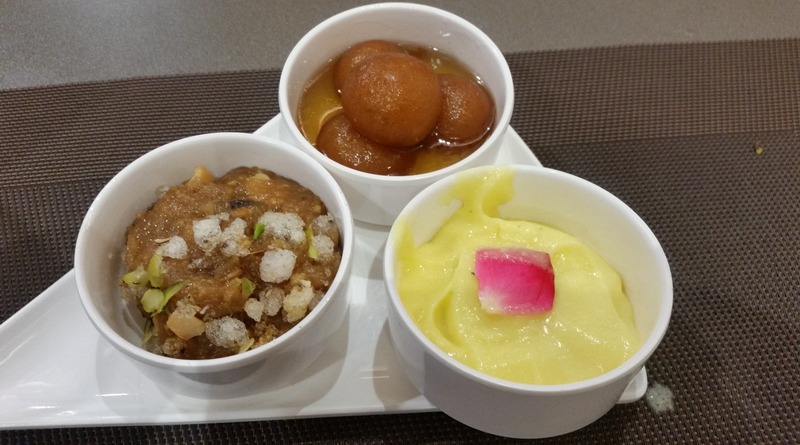 The desserts platter had Gulab Jamun and Gond Pak Halwa, apart from some Shrikhand. Gond is edible gum which is widely used in Gujarati and Rajasthani cuisines. This is combined with milk, dry fruits and nuts to make this halwa. The gulab jamuns were soft and lovable. The shrikhand was not overly sweet which was to my liking. 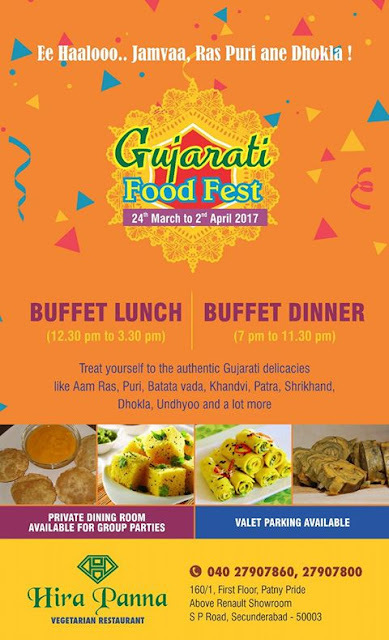 The festival is on till 2nd April for both lunch and dinner buffet. Pricing is extremely attractive at Rs 399. 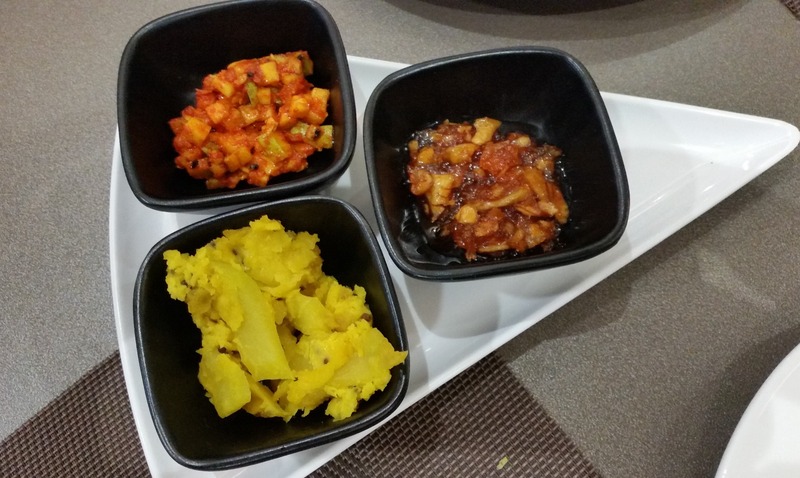 The menu changes every day and may include other favourites like Batata Vada, Khandvi and Patra. This was my first visit to the restaurant and I was pretty impressed with the taste of the food, which was simple but delicious. However I must state here that I am not very knowledgeable about Gujarati cuisine, hence would not use the much touted “authentic” word.